You and your employees can get your work done anywhere with the help of our Enterprise Email service. Ginger Domain ensures that you stay connected and are up-to-date by the means of either your mobile phone, desktop, or through the web. We offer professional services to take care of the backbone of your business and making it hassle-free process. With our standby email service that captures all incoming and outgoing email to give 100% delivery uptime, you can be assured that your business is always running. Pricing starts from Rs. 250/mo per user. Your domain. Your emails. Your users. We help small business owners by raising the quality of their email service to the highest professional level which makes it convenient for them. You can maximize security and strengthen communications with your employees and customers by finding from among our range of services the one most suitable to you. Your email anytime, anywhere, and any device. 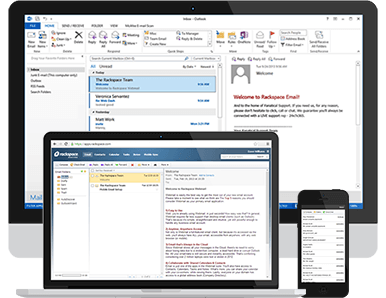 You can access any email client on PC and Mac like Microsoft Outlook, Lotus Notes, Apple Mail, Mozilla Thunderbird, any other POP3/IMAP mail client or any smartphone and tablet through webmail. Our premium anti-spam and anti-virus protection helps you to get rid of spam and viruses. Also, we help you to keep your business email private with our strict, ad-free policy. Email communication greatly affects your business. Downtime has a negative impact on your productivity. So, business is down when the emails are fewer. To avoid this situation, we back Enterprise Email Hosting with an unmatched Network Uptime Guarantee and SLA. If you have any questions about Ginger Domain Enterprise Email service, feel free to contact us anytime. Our support team is always ready to help you round the clock. We’ll respond quickly.